Tom Gasek, graduate director for RIT’s School of Film and Animation, led a workshop for industry professionals on photographic animation techniques based on his book, <em>Frame by Frame Stop Motion Animation</em>. Even though Sweden and Peru are separated by more than 11,000 miles, together they both hold keys to unlocking partnerships that are quickly resulting in one-of-a-kind research and scholarship opportunities for RIT faculty and students. As RIT works diligently to extend its global reach, these newest intercontinental partnerships are perfect examples of how RIT is leveraging differences by enhancing global engagement and broadening the university community’s understanding and appreciation of the world we live in. Malmö, Sweden, and the university bearing its name, Malmö University, have been compared to the “Brick City” when it comes to celebrating creativity and innovation. Post-industrial Malmö has undergone a major transformation with neighborhood re-development, the attraction of new biotech and information technology companies and an influx of students at Malmö University, founded in 1998. Many of those students are earning bachelor and master’s degrees similar to those at RIT including sustainability, computer science, engineering, design, sociology and anthropology, architecture and urban studies, among others. But the similarities don’t end there. Faculty from Malmö University and RIT share a strong interest in applied research. In 2013, RIT hosted several Malmö University faculty members and the partnership blossomed this last past fall when 31 RIT faculty from a cross-section of colleges traveled to Malmö for a series of “labinars” — interactive discussions designed to encourage the development of concrete proposals for collaborative research and scholarship, teaching, program development and more student and faculty exchanges. Elizabeth Hane, a forest ecologist and associate professor in RIT’s Gosnell School of Life Sciences, jumped at the opportunity to study Sweden’s “greenery”—the outdoor spaces of Malmö —while planting seeds that are blossoming into promising research opportunities. Hane is fascinated by how green spaces are conserved, as well as how these green spaces contribute to our well-being—and how different cultures value them. Collaborations with Malmö University faculty member Ebba Lisberg Jensen have enabled Hane to incorporate these questions into her curriculum and may even result in a culminating capstone project for RIT’s environmental science students. Uniquely collaborative projects based in many disciplines and colleges are coming to fruition and will likely make a difference in the lives of those living here and abroad. This past August, the Skåne region of southern Sweden, which includes the city of Malmö, was hit with devastating rains. Flash flooding prompted SOS calls to authorities by stranded homeowners and motorists, and manhole covers started to lift and float. Brian Tomaszewski, assistant professor in the Department of Information Sciences and Technologies in the Golisano College of Computing and Information Sciences and an expert in geographic information systems and computing mapping related to disaster management, used his trip to Malmö in October to mentor students in his freshman honors seminar to build a web platform and actual working game based on a flood scenario that will help emergency response teams handle future disasters. This work is an extension of Tomaszewski’s ongoing research with the United Nations and the honors students will continue the work this spring. From its economy to its geographical features and history, Peru has become a draw for RIT researchers yearning to share their own scholarly endeavors and learn from the natives of this diverse South American country. Peru is one of the fastest growing economies in South America and is a melting pot of cultures. But while many think of Peru as the home to ancient ruins like Machu Picchu and Incan empires, it is also enjoying a rise in human resource development, with the Peruvian government investing heavily in science, technology, engineering, mathematics and business. It is also an economic driver and influencer to neighboring countries such as Colombia. Hector Flores, dean of RIT’s graduate studies, is RIT’s academic guide on this global excursion. He has brought his Peruvian background and connections front and center to help facilitate significant research opportunities for faculty members looking for unique experiences. RIT has signed formal exchange agreements with two universities in Peru—Pontifical Catholic University of Peru (PUCP) and Universidad del Pacífico in Lima—allowing for cultural exchange and research opportunities for faculty, along with the possibilities for student exchange programs and study abroad. Flores is also anticipating the development of a pipeline of graduate students from Peru who will earn their degrees from RIT. From criminal justice and architecture to industrial design and imaging science and beyond, RIT faculty members are creating partnerships that are bridging cultural gaps. In 2014, 11 RIT faculty members and administrators visited Peru and laid the foundations for RIT students and faculty to travel and learn in the country. Alex Lobos, assistant professor of industrial design and Miller Professor for International Education at RIT, challenged the 95 Peruvian university students he encountered during an international design event by asking them to design a line of office supplies that reduce procrastination. Lobos said that he is collaborating with the event coordinators to formally publish the results of the conference and also hopes to develop industrial design student exchanges soon. Tom Gasek, graduate director for the School of Film and Animation in the College of Imaging Arts and Sciences, was hesitant—for about one nanosecond—to travel to Peru. He thought the language barrier would be difficult to navigate, but he’ll be the first to tell you that the communication was easy. 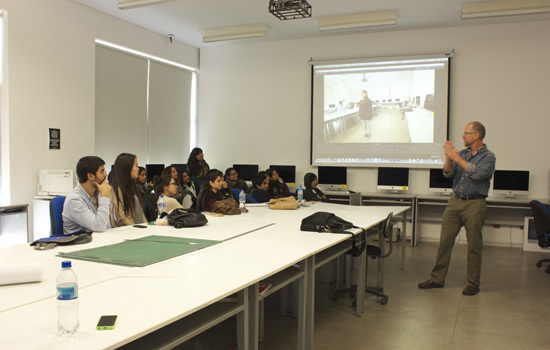 Gasek attended an international film festival at PUCP and presented a workshop to industry professionals on photographic animation techniques based on his book, Frame by Frame Stop Motion Animation. “The students and faculty in Peru are just so receptive,” he said. “I ‘skyped’ several times with a class of film students prior to my trip, so I had already developed a solid relationship with them.” The excursion also launched the Andean Region Association of RIT alumni chapter that hopes to raise scholarship funds for Peruvian students planning to attend RIT. Peru is among the 10 most biologically diverse countries in the world, and two-thirds of the country is covered by the Amazon rainforest. According to administrators, Pontifical Catholic University of Peru, founded in 1917, is one of the 25 best universities in Latin America and the only Peruvian university to be listed among the top 500 universities in the world in international rankings. A class of RIT students earned their LEED construction certifications with help from Lourdes Gutierrez, a Peruvian exchange student who was the first to study at RIT under the Clinton Global Initiative. Editor’s Note: This story is part of a continuing series that demonstrates RIT’s commitment to the new Strategic Plan. Tina Lent, director of RIT’s museum studies program in the College of Liberal Arts, was the keynote speaker at Universidad del Pacifico in Peru, for an exhibition of World War I posters. The city of Lima, Peru, was the backdrop for RIT faculty who visited two universities to develop collaborative partnerships for future research. Another goal is to continue hosting Peruvian students who attend RIT. There are even preliminary discussions about winter intersession study abroad in Peru for RIT students. RIT faculty members and administrators, including Hector Flores, dean of graduate studies, third from left, traveled to Pontifical Catholic University of Peru to share ideas for research opportunities and faculty and student development.